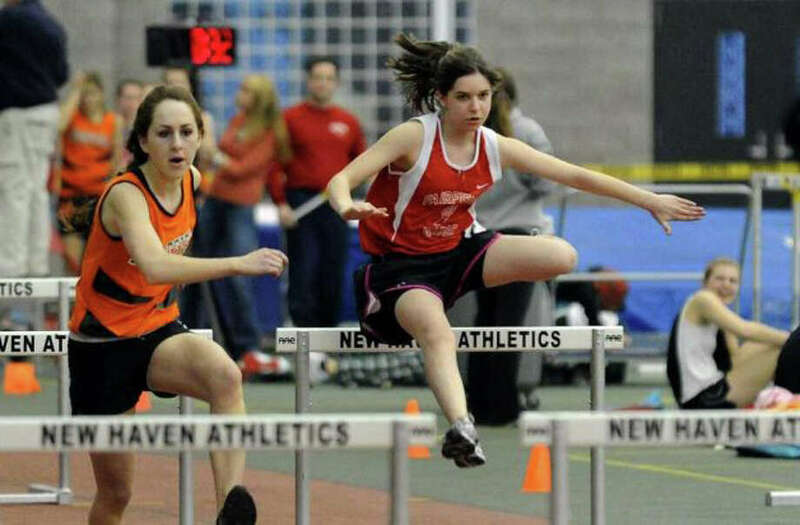 Fairfield Warde's Zoe Robbin, pictured competing at the 2011 FCIAC indoor track competitiion in New Haven, will be one of the Mustangs' top hurdlers in 2012. The Fairfield Warde girls indoor track team has some outstanding returning distance runners. The Mustangs return a substantial core of seniors, mixed in with tremendously talented sophomores to make up one of the best distance groups in the state. Those distance runners will lead Warde in the 2012 season. Returning will be seniors Lexi Hoadley, Jillian Tallent and Jackie Wall. Tallent came in eighth place and Hoadley finished 15th at the Class L meet in the 3,200 meter run last year. Wall was 20th. Warde's top-distance runner, however, will be sophomore Cate Allen. Allen was No. 1 at the Class L meet in the 1,600 meter run and seventh at the State Open, qualifying for New Englands as a freshman. Allen also is versatile, and can compete in relays as well. "She provides the team with great depth to her racing range," head coach Shawn Sorbello said. "She showed her talents all the way to New Englands last year." Strong junior distance runners will be Caroline Keough, Katie Tangney and another sophomore, Sophie Flay. Warde also expects great things from its sprinters senior Sara Collins and sophomore Megan Overby as well. Sophomores Erika Leppla and Zoe Robbin will be the Mustangs' top hurdlers and seniors Jenny Bowers and Jocie Thibault should be Warde's best throwers, with Thibault specializing in the shot put.